Every once in a while, our local news stations does something that drives me crazy. (At least the stations that we generally watch, KTLA and KNBC). Both stations generally have helicopters with video cameras. Both stations love police chases. Both stations will drop all other coverage of events that are going on in the area and broadcast the chase. This happens all the time. I think this sort of thing started back in the 90’s with broadcast of the OJ Simpson chase. So what did the guy do? We don’t know. We never found out. KTLA broadcast the entire episode with only two breaks for commercials. If it weren’t for the fact the news was only an hour, the coverage would have lasted until the chopper ran out of gas. Luckily it was recorded on our DVR. So I hit the FF button to do the entire broadcast in five minutes. It is time to write and update on Mary. She has been doing pretty well lately, She goes to the YMCA in San Pedro twice a week to exercise. 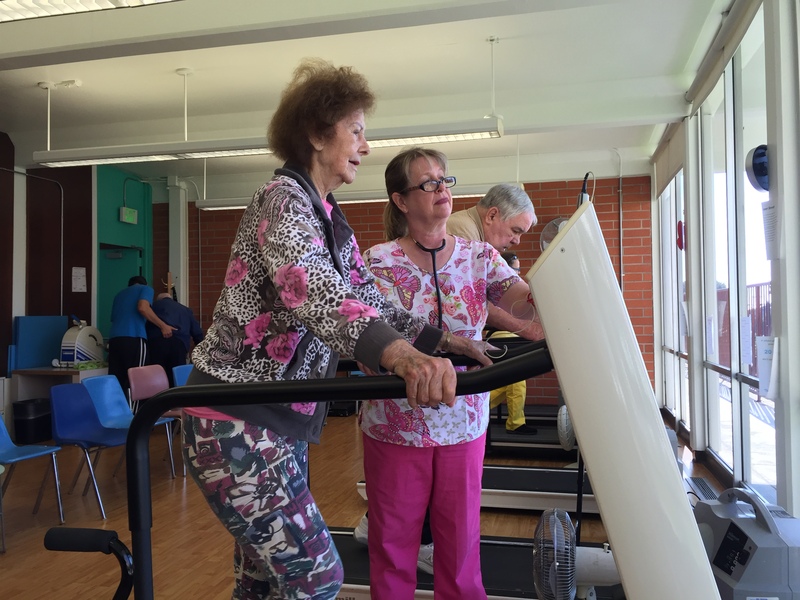 The YMCA has a program that they call “Beyond Rehab” that runs twice a week. The room has the usual exercise equipment like treadmills and recumbent bicycles. The room is staffed with a nurse and a respiratory therapist (and some times student nurses). The program is designed to help folks who are recovering from falls, strokes and other misfortunes of growing old. Mary always likes to stop and watch the little children in the YMCA pre-school program. So yesterday, Mary had a follow-up appointment with her neurologist. Paula usually takes her to most medical appointments. She is doing remarkably well for someone her age. They had her do some sort of cognitive function test to judge how well she is doing. They asked questions like “What day is it?” or “What city do you live in?” etc. She did pretty good in that she got 23 out of 30 questions right. The major issue the neurologist is monitoring is “hydrocephalus” or water on the brain. Here is an interesting article about the condition. In Mary’s case it primarily affects her walking abilities. There is nothing much that can be done. A surgeon could install a shunt to reduce the pressure of the spinal fluid, but that would be extremely risky for someone of Mary’s age. So we just monitor and visit the neurologist every six months or so. So we are going on nine months without any serious falls. We try to make sure that she ALWAYS has her cane. And we certainly don’t let her drive. (Luckily she hasn’t asked.) We haven’t ventured far from home since our trip to Visalia in October. Our concern is that accidents that happen far from home are much more difficult to handle logistically. We are still trying to figure out how to manage Paula’s and my trip to Boston in May. We can leave her for a couple of hours to go to a movie but leaving for five days is a whole other ballgame. So that’s it for now in San Pedro.